Lots of people seem to be intimidated by growing herbs! I'm not sure why. My friends often think I have some sort of green thumb, when in truth growing indoor or outdoor herbs is easier than you might think. Herbs are such a great addition to your diet. 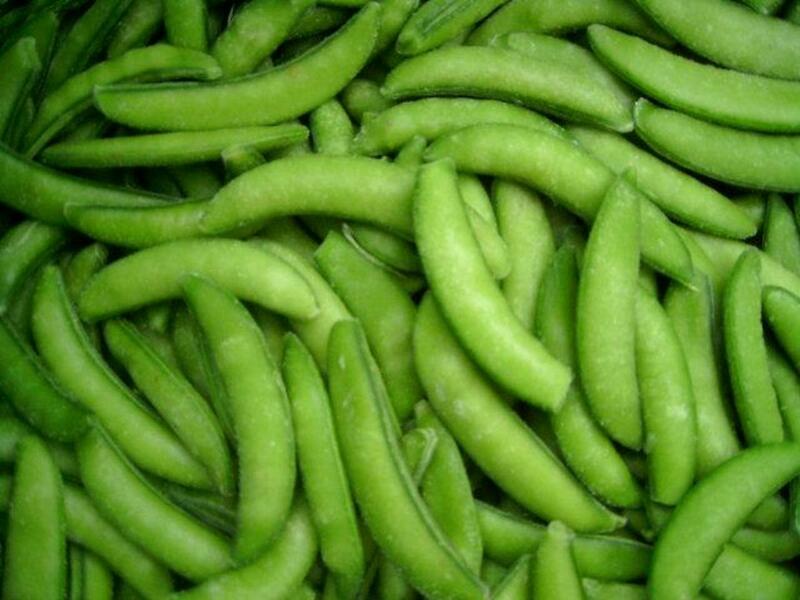 They make food taste amazing, and they're full of goodness and nutrition. It's so easy to add a bit of green to your diet, especially when you have fresh ingredients on hand. There are a lot of easy to grow herbs out there, and your choices are only really limited by your tastes. This article will review 5 of the easiest herbs to grow in pots, gardens, indoors and outdoors. I'll be looking specifically at 'no-brainers', plants that don't require special care or fancy fertilizers. I want to help you grow a tasty garden with minimal effort. With each herb I review, I'll talk about what's required to get them growing and healthy, and where to place them. Let's get started and look at some of the best, easy to grow herbs around today! Even though I'm outlining some of the easiest herbs to grow indoors and out, there is still some effort required! I'm going on the assumption that you'll be planting your herbs from the seed. Good Soil: Unless I mention otherwise, potting soil is what you're going for. It is generally sold pre-mixed, and has fertilizer already added, so your plants will have all the nitrogen and nutrients they'll want. Pro tip: critters sometimes live in potting soil. No, nothing scary, just things like aphids and thrips. Whenever you plant a new set of seedlings, I'd keep them separated from the rest of your houseplants, just in case. Do so until you're sure they aren't housing pests. Liquid Plant Food: Whenever I hear of a friend who's having trouble with their herbs, I recommend liquid plant food. By adding a few drops to your water, you can ensure your herbs will be getting the essentials they need to grow and thrive. With these easy to grow herbs, you'll notice a tangible difference in plant size, flavour and health. I'm not quite sure what my life would be like without basil. Emptier, to be sure. Basil is a very popular herb that can be found in all corners of the globe. It likely originated in India, but it has since spread across the world, and it is a fixture in various cuisines, including Vietnamese, Chinese and Italian dishes. Why is basil one of the easiest herbs to grow? Because it progresses rapidly, lives happily indoors or outdoors, can grow easily in a pot, and it can be continually harvested throughout the season. All basil really needs to thrive is regular watering. You want the soil to be damp, but not wet. I add a few drops of plant food to the water every third watering, and it does really well! In fact, basil can grow to impressive size. Once it is big enough, it will start taking on tree-like properties, like a thicker stem and good height. Harvesting Basil: Be sure to harvest your basil from the top, not the sides. This ensures the plant will grow bushy rather than spindly. Don't let the plant flower if you want to keep eating it; the flavour drops off noticeably once flowering occurs (they're pretty, though). Planting Basil: Most grocery stores sell seedlings, though if you buy those you should beware of pests. Also, be sure to re-pot any basil plants from the store, they're likely to be rootbound. To plant from seed, fill a small pot with soil. Moisten it, and then add about 10 basil seeds per pot. Add a thin layer of soil over these seeds, and then leave it in a sunny spot. Water regularly, so the soil is damp. You should see seedlings within 1 - 2 weeks. Unless you live in a sunny clime, basil won't likely last through the winter. But it is a hardy plant with remarkable durability. It's certainly one of the easiest herbs to grow, and I recommend you give it a whirl. If you love the refreshing taste of a mojito in the summer, or if you simply like a bit of minty freshness in a fruit salad, mint is a fantastic herb. It grows quickly and easily, and will make your garden smell amazing. Nothing is more refreshing than smelling a freshly crushed mint leaf. It makes an amazing tea. Mint is indeed one of the easiest herbs to grow. So easy, in fact, that I'd strongly recommend that you refrain from planting it in open soil! Technically, this is a weed. That means it will grow quickly and take over. That's actually great news if you like using it in your meals. You can harvest regularly and you won't have to worry about killing the plant. Harvesting Mint: You can harvest in several ways. First, you can simply pick the leaves as you need them. This is effective, but can create a spindly plant. Another option is to cut the whole plant, about 1 inch from the ground. Do so right before it flowers. This won't kill the plant. In fact, you can harvest in this fashion 2 or 3 times in a season; it will grow right back! Mint is an herb that will grow throughout the winter, so feel free to move a potted plant indoors when it gets cold. There are several cultivars of mint, including spearmint (good for cooking), peppermint (good for salads and teas), and chocolate mint (good for everything, my personal favourite!). Planting Mint: To get a mint plant started from seed, fill a small pot with soil, moisten it, and then sprinkle the seeds on top. Mint needs light to germinate, so don't cover them (or at least, not much). You can transplant it once you have two full sets of leaves per plant. Alternatively, you can get a seedling from a plant store. Another option is to grow mint from a cutting! It's true, this actually works. Cut the stem cleanly, and then place it in water. Cover the plant with plastic wrap, with a few pinholes in it, to keep the leaves from drying out while it forms roots. Once you see the little white roots appearing, you can transfer it over into soil. Mint is among the easiest herbs to grow. It is tough to kill and tasty in many different cuisines, so I'd give it a whirl! Sage is one of the hardiest plants you'll find in this list. It is very hard to kill! What's more, it is a perennial, so you can enjoy it for many years on end if you treat it well. Sage has a delightful flavour, and once you start using the fresh herb in your cooking, you won't know how you lived without it! Harvesting Sage: The plant is indeed durable, but you shouldn't harvest it down to a stump the way you would with mint. Always be sure to leave a few stalks remaining, so the plant has plenty of opportunity to regrow. You can always just remove a few leaves here and there, of course. With an established plant, you can harvest it 2 or 3 times in a season. Once you've harvested it, you can either use the leaves fresh, refrigerate them, dry them in the sun after harvest, or you can freeze them. Planting Sage: Sage prefers sandy and loamy soil, so select a potting mixture that has those qualities. Plant the seeds just under the surface of moistened soil. Sage loves full sun exposure, so place it somewhere where it will get a good dose every day. I'd recommend starting in a pot and then moving the plant to a sunny spot outdoors, but you can grow it inside. 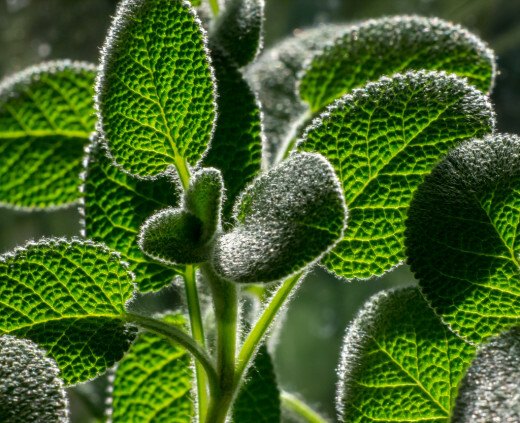 Sage has the tendency to turn into a bush, which is why it's a better outdoor plant than inside. It's actually easier to propagate sage from a cutting, rather than from the seed. Make sure the cutting has about 6 inches of stem, and at least 3 sets of leaves to start. Plant the stem in moist soil, and ensure the plant doesn't dry out (using plastic wrap or a half plastic bottle). Once it starts growing roots, you're good to go! Sage is one of the easiest herbs to grow, and with its great taste and fragrant aroma, it is well worth your time to cultivate! Ah, chives, one of the easiest growing herbs out there. I'm not exaggerating when I say that they will often grow through the colder months, even if planted outdoors. Chives are related to onions, leeks and garlic, and as such they have a similar, savoury flavour profile. They grow vigorously and provide a good yield. They're also a very virulent plant, and I'd be careful planting them in the garden. The seeds spread rapidly and it this colourful little plant with its purple flowers can take over. You can eat the whole plant, including the flowers. 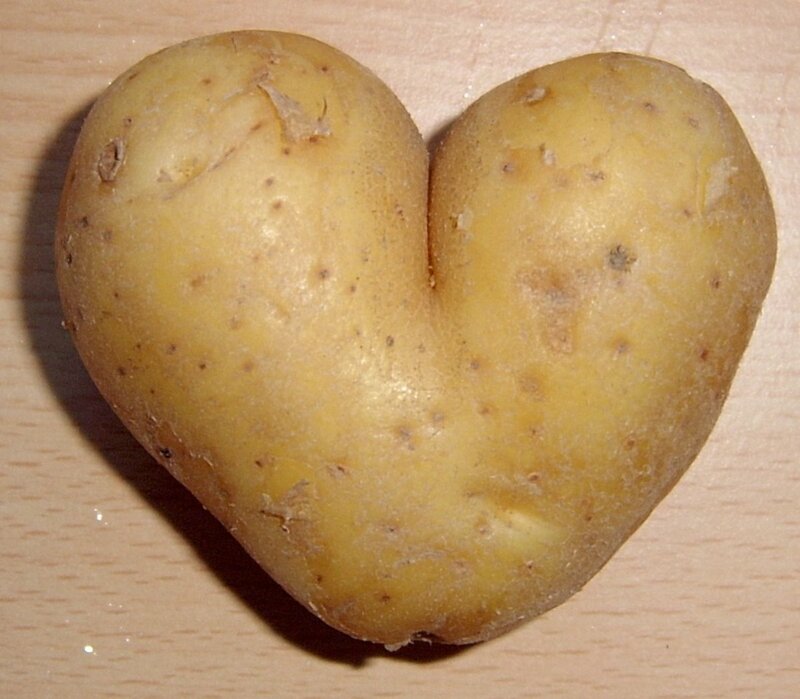 They impart a great flavour to things like mashed potatoes. Harvesting Chives: This is an easy to grow herb for a few reasons, one of which is harvesting. You don't have to worry much about harming it during harvest: you can pretty much take the whole thing. Cut the plant near the base, about an inch or so from the soil. It will grow right back, and you can get several harvests per season. You can expect to harvest in about 4 - 6 weeks from the time you plant. Be sure to use the whole thing, the flowers are great. You can use them fresh or freeze them, but don't dry chives, they lose their flavour. Planting Chives: Chives want a rich soil, so most regular potting mixes work well. They love compost and organic matter, and they respond really well to plant food. Like most of the herbs here, you want the soil to be moist but not wet. Chives grow readily from the seed. Plant each seed about a quarter inch deep in the soil, and make sure there is about 6 inches of separation between each plant. 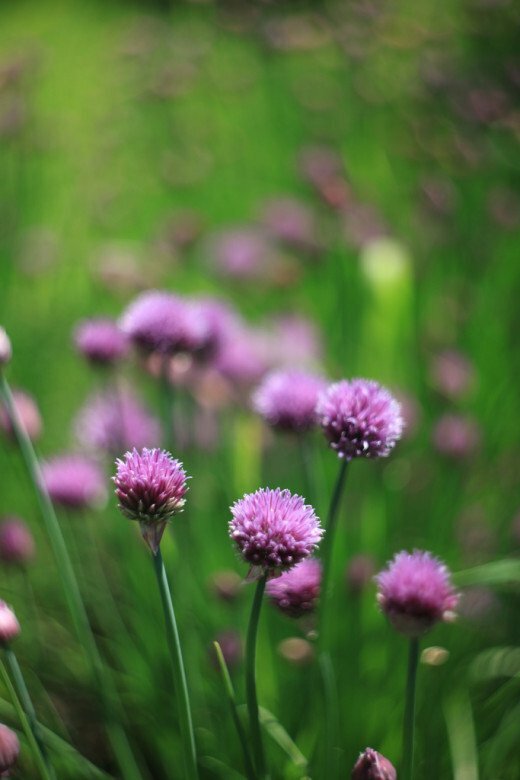 Chives are perennials, so once you've planted it it will keep coming back each season. If you've got it in a pot, you can transfer it indoors during the winter. They love full sun, so keep them in a bright location. Varietals include garlic and onion chives, with each imparting a flavour similar to that plant. Throw them chopped into a salad for a nice hit of flavour, or use them in cooking. In any event, chives are one of the best and easiest herbs to grow. You don't have to love dill pickles in order to appreciate dill as an herb! It is a delicate and amazing flavour, which improves everything from salad to salmon. You can use it in so many ways, and I'm always amazed by the extra taste dimension it adds. Dill also happens to be a very simple herb to grow, and it works well in both a pot on your windowsill and in your garden as a companion plant. There are many ways to enjoy this tasty, annual plant. Harvesting Dill: Harvesting dill is really easy. It's such a delicate plant that you don't need scissors; you can just pinch off the amount that you need. You can take larger stalks with scissors, and it regrows readily. You can dry dill, freeze it or keep it fresh in the refrigerator for a few days. I personally think it is best enjoyed fresh, that's when the flavour is the strongest. Planting Dill: Fortunately, dill is also really simple to plant and care for. Plant the seeds about a quarter of an inch in rich, moist soil, and leave a good amount of room between plants. Dill actually doesn't do so well when you transplant or move it, so wherever you plant it, keep it there. I'd plant your seeds in a large pot if you plan to keep it indoors, or directly into the garden plot where it will end up. If you feel like your dill is thinning out, just plant a few more seeds! The nice thing about this herb is that it grows very quickly, so you can have many harvests in a season. Dill loves full sun in order to grow to full size, but be sure to water it regularly. Overall, dill is a fast-growing, easy to maintain herb. And yes, you can use it for dill pickles if you want! Do you prefer to grow herbs indoors, or outside? Others to Consider? Use your Imagination! This list isn't the final word. There are a lot of really simple to grow herbs and plants that you can harvest for food. These just happen to be my favourites. Other plants to consider include oregano, thyme, rosemary, cilantro and parsley. Whether your herb garden is indoors or out, you'll have a fresh selection to pick from whenever you have these plants on hand. There are other things I like about easy to grow herbs and veggies. Having them in your home means you'll be a bit more adventurous with your cooking, and you'll be inspired to branch out and try new cuisines. Kids love growing plants, so it can make a fun activity to do with them. It's a great test of responsibility, too. Finally, plants help clean the air, and herbs in particular will add an amazing fragrance to your home. Nothing smells quite so good as basil plants in bloom! What are the easiest herbs to grow, in your opinion? Wonderful article! Herbs are one of the tastiest plants to grow. Great info here . . . oregano is also a super easy herb to grow. I love the smell of mint leaves! :) I use it in my detoxifying drink mix. And my mom loves the chives!